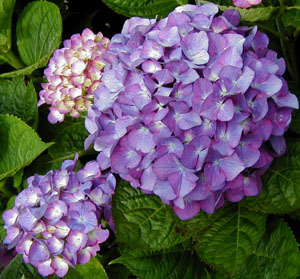 Joy Creek Photo Archive (c) all rights reserved Hydrangea 'T�di' (Kobel & Schutz) is best suited for less acid soil. Our 'T�di' blooms with a lilac blue cast. The individual florets are so huge and papery that we suspect the plant needs more protection from the sun. Nice large foliage for a smaller plant. Developed by the Federal Research Institute for Horticulture, Wadenswil, Switzerland, 1952. Early summer to midsummer. 3 ft. x 3 ft.